On September 16th, during the Beacon Food Forest’s monthly work party, we dedicated Nicole Kistler’s artwork Vessels. The artworks are a series of cast iron sculptures that dot the community garden on Seattle Public Utilities property at Beacon Reservoir. Building on the inspiration of the reservoir as a container, they evoke puffball mushrooms holding spores, berries holding seeds, seed pods, and ceramic water jugs. Likewise, the sculptures hold stories from the community. Kistler interviewed Food Forest volunteers and neighbors over several summer months capturing food stories and traditions on audio, and imbedding them into the permanent works. The artist also held a series of seed ball workshops bringing attention to fruit and vegetable production in an urban settings. 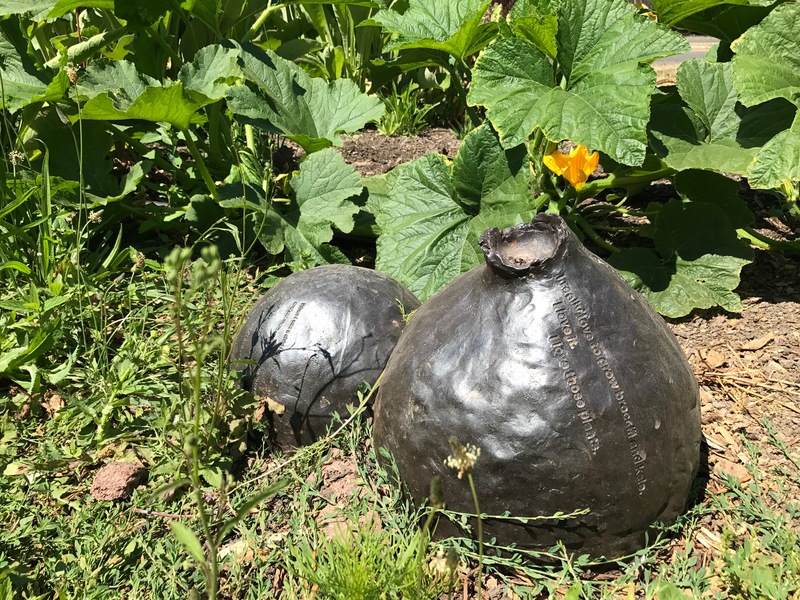 Kistler worked closely with the Food Forest’s Steering Committee, Co-founders Jacqueline Cramer and Glenn Herlihy, and Arts and Culture Chair Julia Haack, all artists in their own right, to integrate the organically shaped sculptures throughout this urban permaculture garden. Seattle Public Utilities (SPU) encourages urban farming through its solid waste program; Kistler wrote an Urban Agriculture art plan following a residency investigating opportunities for artist engagement in urban settings, such as P-Patches run by the Department of Neighborhoods, Seattle Parks and Recreation ‘s food production facilities and SPU’s Beacon Reservoir. Kistler identified Beacon Food Forest as a potential site for a community-engaged process to develop and locate a permanent art project. SPU entered into an agreement with the P-Patch program to develop and expand the Food Forest. This artwork, on SPU property, highlights the opportunities to raise food in city as a community-centered activity, and the need to encourage sustainable practices in urban food production.